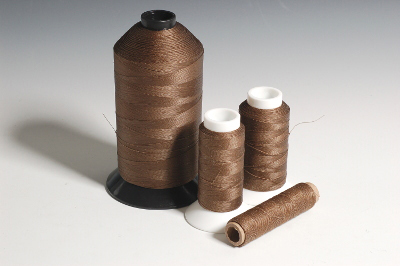 PTFE coated fiberglass thread is made from continuous fiberglass filaments that are heat resistant, chemical resistant, and strong. The fiberglass is also coated with a PTFE, a.k.a Teflon (tm) finish to improve sewability, and reduce friction. It can withstand operating temperatures to around 1022 F (550 C). It is important to note the PTFE coating burns away at 620 F (320 C). This means the coating will propagate flame, but the fiberglass will have a greater heat resistance.